Nine days into the search for missing Malaysia Airlines flight MH370, investigators have refocused their efforts on looking into the backgrounds of the pilots, crew and ground staff for clues about why someone deliberately flew the plane off course. Investigators searched the homes of both the pilot and copilot for the first time after Malaysian authorities announced on Saturday that the aircraft’s communications systems had likely been turned off by someone on board. 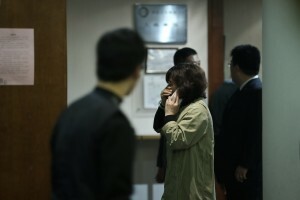 Other details came to light indicating that part of the jet’s communication system had already been disabled when the final words, “All right, good night,” were spoken to Malaysian air traffic controllers. “This will tell you something … because this is something not normal that the pilot would do,” Maj. Gen. Affendi Buang said when discussing the significance of this information with reporters. Affendi indicated that it was unclear which pilot said those final words and some have questioned whether it could have been another individual speaking. Various experts and officials have expressed have said there is no evidence to indicate disappearance is linked to terrorism. Malaysia’s transport minister Hishammuddin Hussein said they had not received a ransom request or any other demands. “That makes if very difficult for us to verify whether its a hijacking or terrorist,” Hussein said on Sunday. As the investigation turns to those on board the plane, the transport minister appealed to other countries for help and information on Sunday. Hussein asked governments to provide Malaysia with sensitive radar and satellite data that could help in the search. “The search was already a highly complex, multinational effort. It has now become even more difficult,” Hussein said at a news conference. With new tracking information indicating a signal from flight 370 came in seven and a half hours after takeoff, the search area has expanded to cover 11 countries whose airspace the plane could have flown through. The number of countries helping in the search also jumped from 14 to 25. While the search now covers an area reaching from Kazakhstan to the southern Indian Ocean, experts consider it more likely the person in control would have flown south because the northern search corridor has more air traffic. Australia will meet Malaysia’s request to send two aircraft to scour remote islands in the Indian Ocean where the plane might have ended up. Malaysia’s police chief Khalid Abu Bakar appealed for countries to conduct background checks of their citizens who were on the plane. Some countries had already gathered information on their respective passengers, while he was waiting for information from others.